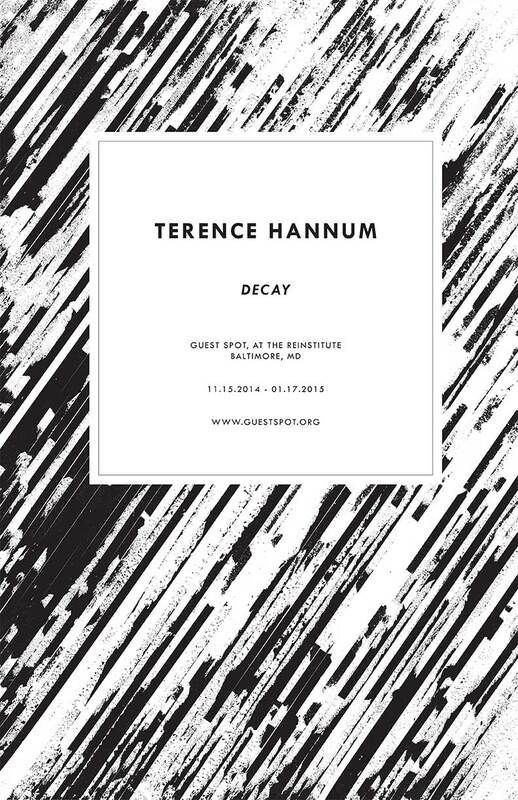 Guest Spot at THE REINSTITUTE is proud to present Decay, a solo exhibition by Terence Hannum. Opening Friday November 15, 2014 from 7pm – 10pm, Decay will be on view through January 17, 2015. A discussion on painting and cross-practices; influences of the self-organized, will be held in conjunction with the closing on January 17, 2015, 2pm-4pm. Accompanying the exhibition will be an essay by Drew Daniel, Associate Professor at Johns Hopkins University and member of the experimental electronic music duo Matmos. Decay is a natural component of the sound envelope; it is part of our understanding of sounds from an instrument, voice, or ambient source in our environment. It is also the natural state that sound media finds itself in – decaying. The record’s surface develops scratches and pops. The Library of Congress is fighting to address CD rot. Cassette tapes accumulate hiss, warble. Moving parts fail. Terence Hannum’s new collages made from commercial cassette tape inherit the properties of paint. The physicality of cassette material adheres to a dense strata that is manipulated and peeled away, leaving behind ferric magnetic dust. It’s within this dust, in the contact between tape and tape head, that sound is captured. Hannum’s use of cassette tape acts as a parallel to current attitudes towards painting; concepts in his work regarding time, memory, and decay become fixed in a period of changing political attitudes and transformation. While the creation of magnetic tape transformed the recording process, bringing about over-dubbing, erasing and time manipulation, Hannum’s collages presents the media anew: a strata of accumulated time and sound, a decay from the mass of potentialities that once was betrothed to paint. Decay will also feature Hannum’s zines and handmade artist’s books, showcasing his research into cassette culture, with elements of cassette tape j-cards, slip sheets and other ephemera. Terence Hannum is a Baltimore-based visual artist and musician who performs solo and with the avant-metal band Locrian. Hannum teaches Foundations in the Art and Visual Communication Design Department at Stevenson University. He has had solo exhibitions at Western Exhibitions (Chicago, IL), Stevenson University, Museum of Contemporary Art, Chicago, Gallery 400 at UIC (Chicago, IL) and been in group shows at TSA (Brooklyn, NY), sophiajacob (Baltimore, MD), City Ice Arts (Kansas City, MO), Jonathan Ferrara Gallery (New Orleans, LA) and more. He recently collaborated with artist Scott Treleaven to compose a soundtrack for the film Picture Yourself in a Burning Building that was commissioned by the Toronto International Film Festival.